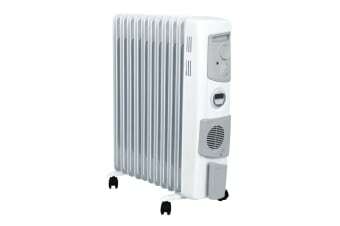 Create a cosy atmosphere in your home with the warmth radiating from the Dimplex 2.4kW Freestanding Oil Column Heater. When the weather starts to turn icy, you need fast warmth. Don’t let your fingers and toes freeze, with the Dimplex 2.4kW Freestanding Oil Column Heater, you’ll enjoy heart-warming heat from any room in your house. Coming in from the cold and need a warm up? Simply switch on and the built-in turbo fan will start radiating heat in minutes. Just want the heat to help you fall asleep? Set the timer and it will turn itself off soon after you’ve dozed off. It’s portable and practical with its freestanding design, rolly wheels, two heat settings and an impressive 2.4kW of warmth, and offers hassle-free storage thanks to the built-in cable hook.